I grew up with this fruit. If there is any fruit in the world that holds the top place of all the fruits that I like, this tart, sweet ugly looking fruit holds that spot. When I was growing up, “Parchita” (what we call it in Venezuela) was everywhere. The fruit can be found in many forms and utilized in many ways – juices, flan, cakes, ice creams, popsicles, cocktails, jams, syrup for shave ice and in some cases for savory dishes too. In Venezuela the most common type of passion fruit is the yellow, or golden variety, which is a lot more tart than it’s counter part – the purple passion fruit found in Australia and other parts of the world. Even after I knew I was going to make this cake. I had to mentally prepare myself for it. Because, this cake is labor intensive - five different components – the cake, the curd, the syrup, the white chocolate custard based and then the buttercream all come together to produce this gem of a cake with a glorious combination of flavors. I was originally going to start the cake on Saturday, mainly because after a year of baking from Rose’s book, you learn to listen to her “plan ahead” tips. In this case it was to compose the cake 1 day ahead and to start with the passion curd at least 3 hours before using. And like everything in my life right now, a completely planned Saturday turned into a nightmare day. By the time I landed myself in the kitchen I was too tired to lift a finger. So cake-making was pushed to Sunday. On Sunday, I was up bright and early and decided to start with the curd first. Butter, egg yolks, sugar and the passion puree are blended and placed over medium-low heat and you get to hang out with it, whisking constantly until it turns into a rich golden color. Past experience has taught me to be a bit fearless and use medium-high heat and keep hawk eyes over the curd for it to not burn. The reward? A perfect curd in less than 15 minutes. After 30 minutes of rest time, it gets covered and into the refrigerator it goes to chill out. Next up the syrup. Sugar, passion puree and a vanilla bean get the heat treatment over medium-high heat until it comes to a rolling boil. Its taken off the heat, covered and left to cool completely. Then I turned my attention to making the cake, which is a classic génoise. Unlike some other sponge cakes that beat their yolks and whites of the eggs separately; the eggs, and sometimes extra yolks, are beaten with sugar and heated at the same time using bain-marie or flame, to a stage known to patissiers as “ribbon stage”. Génoise is generally a fairly lean cake, getting most of its fat from egg yolks, but some recipes also add in melted butter before baking. Rose adds Beurre Noisette. All of the Heavenly Cake bakers have been transformed by the use of Buerre Noisette, or brown butter. Unsalted butter is melted over low heat and allowed to separate into butterfat and milk solids. The milk solids naturally sink to the bottom of the pan and, if left over gentle heat, will begin to brown. As the milk solids reach a toasty hazelnut color, the pan is removed from the heat. Beurre noisette may be used in its liquid state, or cooled to a solid form. It has a nutty flavor and when added to cakes it transform it into something that will make your taste buds dance for joy. The cake came together super fast and made me realized how I have grown as a baker. I measured my ingredients and then put it together without once consulting the book on the steps. While the cake was in the oven, I turned my attention to the White Chocolate buttercream. Which, unlike the cake I have yet to master it. I had good luck and bad luck with Rose’s buttercreams. So I said a little prayer and dove ahead. As soon as I started I realized this was going to be a completely different way of doing this. White chocolate custard is made head by melting butter and white chocolate over a double boiler and then a full egg and egg yolk are added. I got to come clean and tell you that I had a bit of a freaked out, because even thought my eggs were at room temperature, I totally convinced myself they were going to go all whacking on me when I added them to the VERY HOT melted chocolate mixture. I was wrong; the mixture got very thick and then it even out, coming together into a silky custard. To speed up the cooling process, I placed it on my refrigerator and got down to business in unmolding the cake. Next up was the buttercream. The recipe used cream cheese, butter a bit of crème fraiche (or sour cream), the previously done white chocolate custard and some vanilla extract. It came together without a hitch. Then it was time to put it all together. I wanted the cake to be nice and soaked up with the passion fruit, so I decided to split it first, then soaked the bottom layer until it was nice and moist. 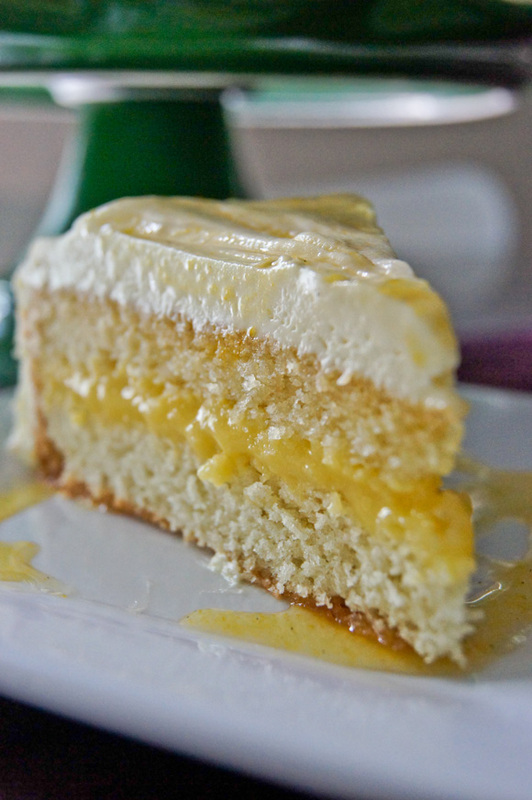 Topped it with the delicious passion fruit curd. Then I soaked the bottom of the top layer some more with the syrup. Glide this on top of the bottom layer, and did some more a-soaking - basically really covering the cake with the syrup. Then I finished the cake by covering it with the buttercream. This cake earned a great big “LOVE” written on top of its page. I loved the cake. LOVED IT. It will be made again and again. As everyone knows by now, I’m no fan of cakes with fruit anything. But, this cake is the definition of heavenly. Like Tom said, it’s not to sweet, but has the right balance to cut into the tartness of the Passion fruit. I will be taking the left over to work tomorrow, and I’m sure I will be getting rave reviews. You can find the rest of the other Heavenly Cake bakers take on this cake if you head over to Jenn’s site.